This year, Britain’s National Trust handed a writer a pearl of great price. Tell you what, they said to writer and philosopher Julian Baggini. Stay at the South Foreland Lighthouse, on the top of the White Cliffs Of Dover, for a week. Contemplate the White Cliffs, and what they mean to the British nation. And then, write down what you found out. The residency took place from August 20 for a week, the week we were there to fly kites at South Foreland and potter around Dover. It is part of a drive to raise £1.2 million to buy a stretch of the cliffs which would complete a five-mile coastal track open to the public. When I see those Cliffs, my heart swells. Not because of symbolism: not because of reasoned argument; but because of story. Story is the thing that catches our hearts and sends us soaring, up from our existence to travel in time and space and viewpoint. Story changes every ability, every age, every class. And this place: because we have lived in it so long, it is drenched, saturated, in story. This is where Henry II built his fortress, to look down with nervous tetchy surveillance on the pilgrims drawn by the assassination of Thomas Becket – an assassination on his watch. This is where Jarvis Lorry and Lucie Manette met to begin their journey across the Channel in Dickens’ Tale Of Two Cities. Above these cliffs men skirmished in spitfires and lost their lives; on them they painted their faces to terrify invaders; inside them they built a honeycomb of tunnels to repel Napoleon, and Hitler, and finally – in papers made public only this year – to retreat from holocaust in a nuclear bunker, built in their very heart, on Dumpy level of the secret tunnels. They look out on treacherous sands and ghost-ships, host to a white lighthouse which seduced the scientists of the 19th century, Michael Faraday and Guglielmo Marconi. It was Christmas Eve when Marconi sent his assistant to shiver on the Goodwin Sands light ship, to receive wireless messages in a test. Squint from the docks and you will see, high on the cliffs, the railings which border a look-out: a platform entrance to the secret tunnels, where have stood some of our most colourful heroes. Winston Churchill knew the cliffs well. He ordered the firing of the guns on at least one occasion. And Admiral Ramsay, a hero every British child should know, stood, heart in mouth,watching the little ships as they returned from Dunkirk full of traumatised soldiers. It is not through cerebral analysis that our Cliffs can finally come to be valued. It is through the litany of fairy tales which surround it. Then, England will turn and look at them, blinking in surprise and say: were you this beautiful all along? How could I have missed you, all this time? The power of the cliffs- the power which has not yet been fully unleashed – is the power of their story. It is through the tales that surround the white chalk sentinels that the £1.2 million can be raised, and the cliffs raised from simply the thing you see when you get home, surrounded by docks and industry and frankly, a poor and undervalued area – to a cherished possession. And that story, so far, remains to be told to the 21st century. Posted in Places to visitTagged Dover Castle, heritage, history, Julian Baggini, National Trust, South Foreland Lighthouse, White Cliffs, White Cliffs Appeal, Writer In ResidenceBookmark the permalink. I recall visiting Varengeville-sur-Mer, Normandy, and looking down to the sea from their white cliffs, much like our own. It was a reflective moment remembering that they were once attached. I am now off to read At Home On The Rock. Enjoy, Rosemary. There are some lovely films attached – on the website, I think – where people talk about what the cliffs mean to them. What a story… you always whip out such gems Kate. I love the way you write – amazing and I understand (I think!) exactly what you are saying. Hope so, Julie. The story’s the thing. Wonderful stories, indeed, I was not able to visit the Cliffs when last we were in England, but, will put them on my list for sure for a future visit. Make sure you leave aside lots of time, Lou. And If I’m in that neck of the woods, I’ll bring the kids to show you both round! Love your view of the White Cliffs. In fact, I love a view of them, full stop. I have related before how evocative they are – our first ever sight of England was a view of them as we flew over from the French coast, and Much Better Half promptly burst into tears. They can have that effect on one, can’t they, Col? They are The Beginning. The Edge. A sort of once upon a time. Evocative indeed, Kate, and as a Kentish man, I don’t visit the Dover area half-often enough! 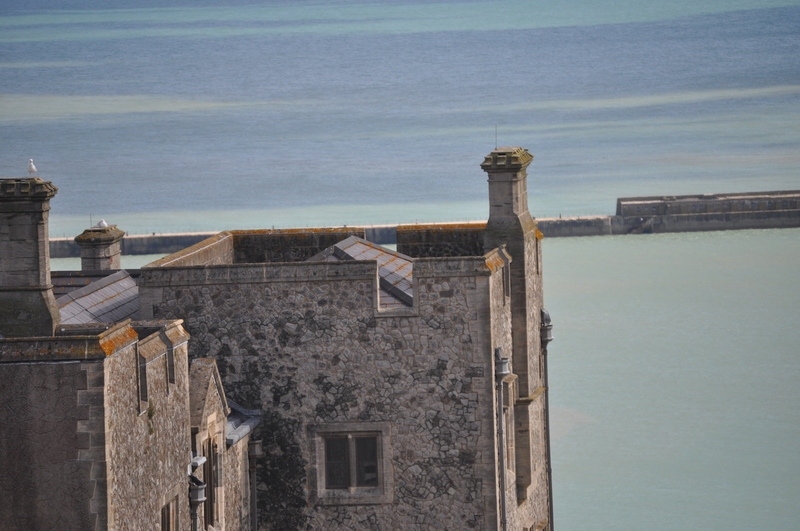 I especially love the views from the top of Dover Castle :). I’ve always wanted to visit the White Cliffs. Your writing only makes that longing more so. They are endlessly absorbing, Andra. Every time I go, I see something new. Pingback: TV Tropes Monday: The Woman in White « Neither Here nor There…. 🙂 Just nice to have you pop in, Myfanwy: no need to leave a comment! Those cliffs are legendary. They figure in so much history it’s hard to know where to begin, isn’t it? I love your shoutout to Bertram Ramsay—he’s one of my heroes, even though I’m not British. 😀 What I wouldn’t give for a week at South Foreland, IE…I’d pay them!! Stirring stuff, Kate. I’ve bookmarked Baggini’s site and will give it a good read. It is really interesting to see the conclusions he came to during his week, Roger. The blog has some footage of passers by and their impressions of the cliffs. Perfect for a WhiteCliff obsessive like me. Pleasure, Debra. I hear the NT is only about £200,000 off its target. The while cliffs will soon be exclusively open to the people…. Wonderful, wonder post, Kate. I’ll be thinking (and humming the song) the rest of the day. How I would love to someday see this. I do hope you do, Penny, because it would mean a mug of tea and a chat would not be far behind 🙂 We could choose from the castle cafe or the White Cliffs cafe…or we could even have cream tea at the lighthouse! I’ve always thought the white cliffs were mythical and quite beautiful.. you’ve confirmed both for me today. I can feel your emotion in the writing of this post. Thanks Barbara. Actually, while the cliffs are lovely, at their base is an area of some considerable deprivation, flanked by a port which was almost sold to the French a short while ago. The Cliffs have their feet rooted in harsh reality. That’s such a shame.. will the fund-raising help to repair that area as well? Sadly not. It will just purchase the last stretch for the Trust. The area needs a lot more investment from a wider arena before it can be an effective setting for the cliffs. Why don’t all those people with more money than they need in a lifetime give back with a project like this. I know I would..
Oooh, Thanks, Judy! I shall listen this with a mug of tea. I do love your stories. I feel like I’ve had a bit of a travel adventure after reading your post. But that’s what writing’s about, isn’t it? Taking the reader somewhere? For today, there’s no place I’d rather be. I often feel like that visiting other blogs, Barb. Blogging broadens the horizons, doesn’t it? I hope you submitted this to them Kate? I’ll go now to see Mr. Baggini’s blog but I doubt he’ll give them anything more powerful to base their campaign on. Beautiful photos, Kate. Let’s hope the money is raised. I’ll look at those cliffs with a whole new meaning in my heart…Wonderful history! !